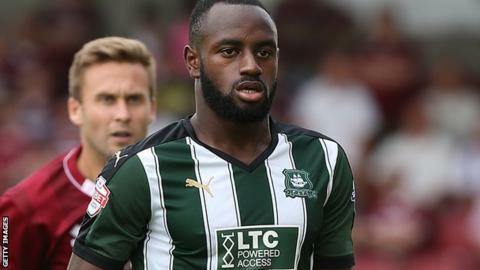 Hiram Boateng pounced to score a late winner as Plymouth Argyle beat Crawley to go to the top of League Two. Reuben Reid put Plymouth into a first-half lead after latching on to Graham Carey's through ball. Crawley thought they had earned a point after substitute Roarie Deacon bundled in four minutes from time. Midfielder Boateng, on loan from Crystal Palace, swooped on a rebound after Freddie Woodman failed to hold Carey's thundering 25-yard free-kick. Plymouth moved two points clear at the top of the table as previous leaders Wycombe were beaten at home by Northampton. "I think it would have been a classic away performance had we got the point that I thought we deserved, which I think our second half deserved. "Plymouth are a good side because they are settled and they were better than us in the first half but in the second we showed greater conviction. "There are signs that I am liking and there still things we need improving and we will be doing everything to put that right. "We've got one or two bumps from today and we will have to pick ourselves up. We have to get in the habit of doing things right." Match ends, Plymouth Argyle 2, Crawley Town 1. Second Half ends, Plymouth Argyle 2, Crawley Town 1. Mitch Hancox (Crawley Town) wins a free kick on the right wing. Goal! Plymouth Argyle 2, Crawley Town 1. Hiram Boateng (Plymouth Argyle) left footed shot from the centre of the box to the bottom left corner. Attempt saved. Graham Carey (Plymouth Argyle) left footed shot from outside the box is saved in the top centre of the goal. Foul by Liam Donnelly (Crawley Town). Sonny Bradley (Crawley Town) wins a free kick on the right wing. Goal! Plymouth Argyle 1, Crawley Town 1. Roarie Deacon (Crawley Town) left footed shot from very close range to the bottom right corner. Substitution, Plymouth Argyle. Ryan Brunt replaces Gregg Wylde. Corner, Plymouth Argyle. Conceded by Shamir Fenelon. Substitution, Crawley Town. Shamir Fenelon replaces Rhys Murphy. Hiram Boateng (Plymouth Argyle) wins a free kick in the defensive half. Mitch Hancox (Crawley Town) is shown the yellow card for a bad foul. Josh Simpson (Plymouth Argyle) wins a free kick in the defensive half. Foul by Mitch Hancox (Crawley Town). Gwion Edwards (Crawley Town) is shown the yellow card for a bad foul. Foul by Gwion Edwards (Crawley Town). Substitution, Plymouth Argyle. Josh Simpson replaces Jake Jervis because of an injury. Roarie Deacon (Crawley Town) wins a free kick in the defensive half. Substitution, Crawley Town. Simon Walton replaces Ross Jenkins. Attempt missed. Josh Yorwerth (Crawley Town) right footed shot from outside the box is too high. Attempt blocked. Roarie Deacon (Crawley Town) left footed shot from outside the box is blocked. Corner, Crawley Town. Conceded by Peter Hartley. Attempt blocked. Rhys Murphy (Crawley Town) left footed shot from outside the box is blocked. Attempt missed. Kelvin Mellor (Plymouth Argyle) left footed shot from the centre of the box is too high. Attempt missed. Gwion Edwards (Crawley Town) right footed shot from the left side of the box is too high. Substitution, Crawley Town. Roarie Deacon replaces Lewis Young. Foul by Hiram Boateng (Plymouth Argyle). Attempt saved. Gregg Wylde (Plymouth Argyle) left footed shot from outside the box is saved in the top centre of the goal.